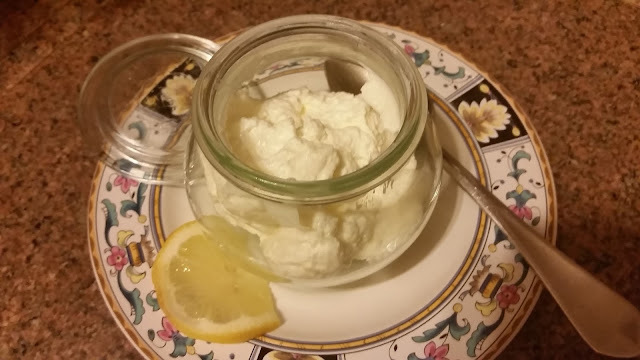 Homemade yogurt just sounds so...70s? I mean, I don't remember my mom making it, but I remember some kind of yogurt maker thingy gathering dust in the basement. 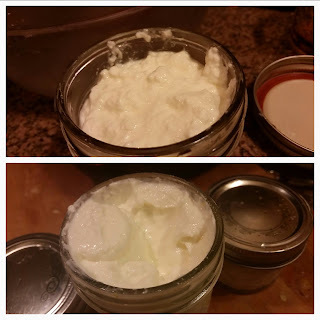 I gave it a try, though, and though my first batch was a flop because my starter was too old, I've made a few batches since then and I'm totally sold. I was surprised by how delicious it was. When you want to buy dairy products made with low sugar, few additives and milk from hormone-free, preferably pastured cows, it can get pricey. Making it at home, a $3.99 quart of really good unhomogenized milk will yield about the equivalent of $6-12 of good quality yogurt, and if you get a better deal on the milk you'll save even more. Plus, you use less plastic, and you can decide the fat content and whether or not to add sugar for flavor. The process takes around 8 hours, so if you can time it to go overnight, that's ideal. You can do it using a yogurt maker, an oven, or even a heating pad if you have one that doesn't shut itself off after an hour. I'm using the Gizmo you've heard so much about: the Instant Pot Duo (the Duo and Smart models have yogurt settings, but the Lux does not). I start with a quart of milk, but I've done twice that, and you can do up to a gallon depending on how much you think you'll use in two weeks. I've been using whole, unhomogenized milk as I prefer to use less processed ingredients, but you could use skim or 2% if you like. 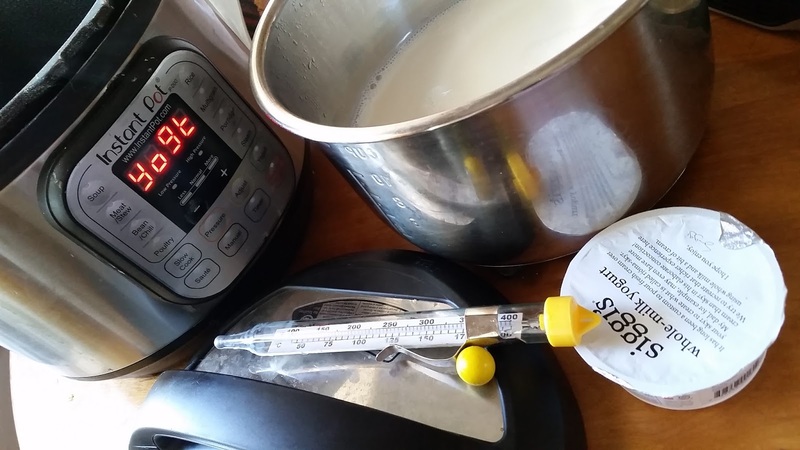 The first step is to scald the milk, and my Gizmo lets me press two buttons to make that happen: Yogurt and adjust. 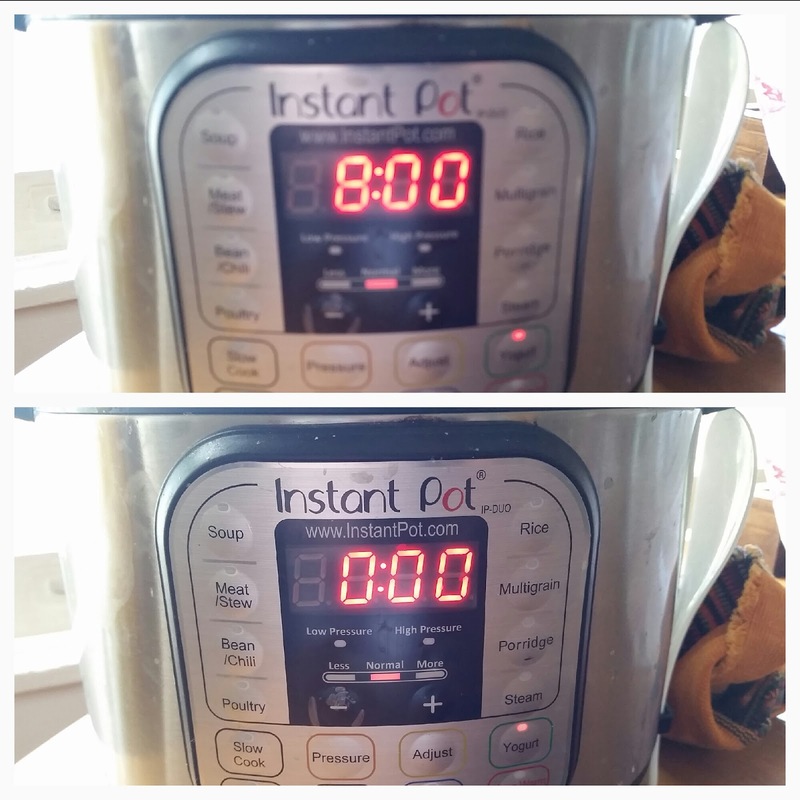 The display will say boil as you see here, and then I just put the lid on. 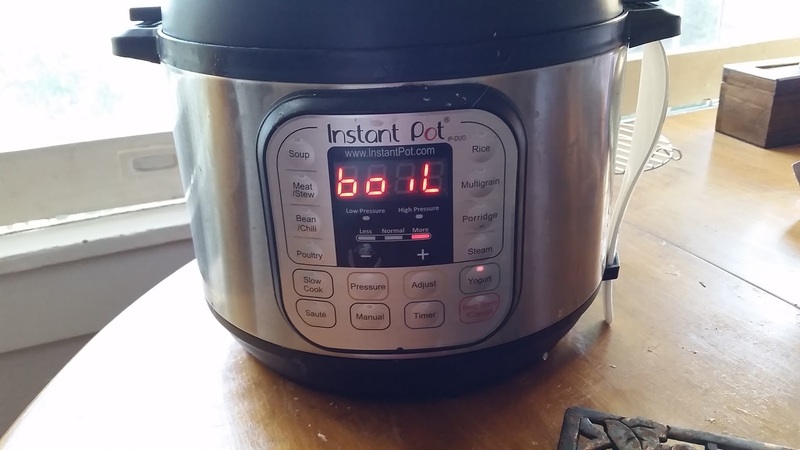 It'll probably take more than half an hour to come up to temperature, but then it'll beep at me so I don't have to stand in the kitchen watching the pot while it happens. I've let entirely too many pots of milk boil over by getting distracted! When it reaches temperature, the Gizmo beeps and the display says yogt. I remove the liner from the pot and give the milk a stir with a clean spoon to help it come down to 115 degrees. Some people use fancy thermometers that also beep when the temp is reached. 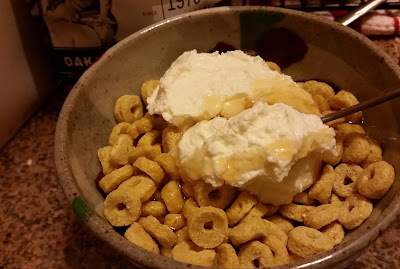 I use a candy/frying thermometer that I got for about $5 at the supermarket. 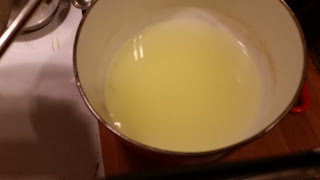 Once it's there, I stir in a couple of spoonfuls of plain, good quality yogurt to start transforming the milk. Use 1/4 cup for half a gallon Update: after more experimenting, I've determined that 1 tsp yogurt per cup of milk is a good number. You can use the yogurt from the last batch as a starter as long as it's no more than two weeks old. I forgot to set some of the last one aside! Many people also stir in a couple of tablespoons of powdered milk, but I have bad memories of that stuff from childhood. No more of that! Next, I put the liner back in the IP base and put the lid back on. 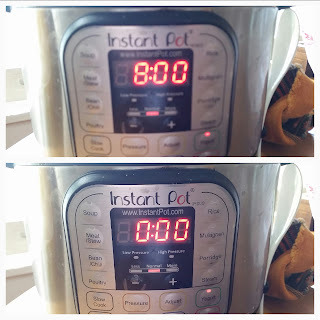 When you press the yogurt button, the display will show 8 hours, but you can use the + button to add more time if you like your yogurt more tart. You can also stop it at 8 hours and add more time if it's not quite there. After a few seconds, the 8:00 display will switch to 0:00 and start counting forward. When it reaches 8 hours, it will beep and let you know it's finished, and the display will say yogt again. The first time I tried this, I miscalculated in my excitement and it went off at 4. It would have been fine sitting in the thing with the lid on for a couple more hours, but since I was awake I had to get up and check it out! At this point, assuming your starter yogurt was OK, you've got yogurt! You can eat it as is or flavor it in its current state. However, if you strain it, you'll have a creamier, thicker, sinful-seeming product resembling the Greek yogurt everyone is so crazy about these days. To strain, spoon the yogurt into a cheesecloth-lined strainer or a nut milk bag. 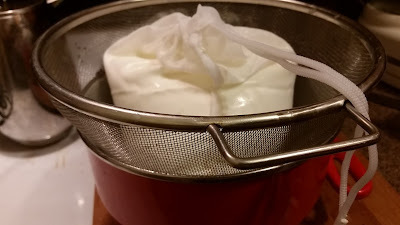 You can set the nut milk bag in the strainer, too, or if you have knobs on your kitchen cabinets you can hang the bag from one of those. No knobs in my kitchen! Either way, put a bowl underneath to collect the whey. Let it drain for 1 to 2 hours. The whey can be used as a calcium booster in smoothies or, apparently, in many other things! I have only tried it in smoothies, and I barely noticed the taste. But back to the yogurt...it'll still be a little lumpy when it's done straining. You can put it into a bowl to whisk it smooth, and it'll look like the one at left below. I cheated to avoid cleaning another bowl and just stuck the whisk in the nut milk bag. Worked great! Now, spoon the yogurt into containers. I have a gazillion 4 and 8 oz jars on hand, so I measured them out for lunches. 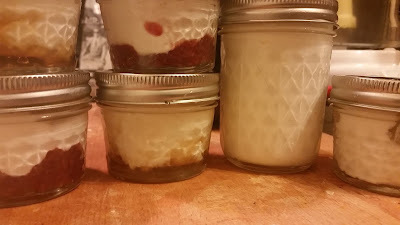 I decided to make some "flavor on the bottom" jars, kind of like my favorite childhood brand. 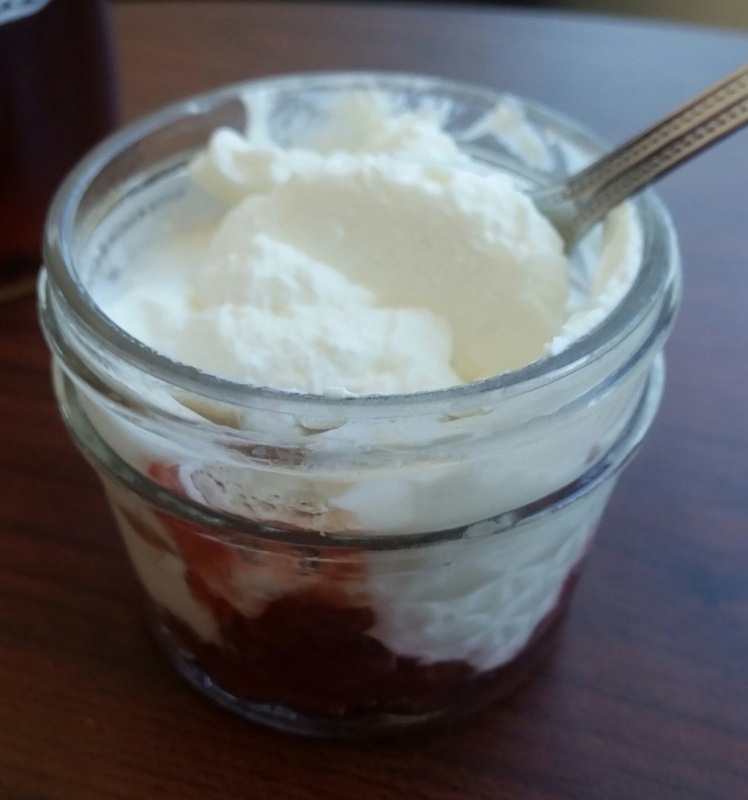 I put two teaspoons of maple syrup in the bottom of two 4 oz jars, and two teaspoons of raspberry jam in two more jars. Then I remembered my real favorite from back in the day: lemon yogurt. To the 8 oz jar, I added a very little bit of grated lemon zest and just one tsp of sugar. I stirred that one well and left it in the fridge for a few days. Oh. My. God it was good! The last jar is the plain I'll use for the next batch, which will go in tomorrow. Hello, how are you? Hope you are great. i just want to say, i am a big fan of your blog and i really love it very much and hope you also love my blog.